The human brain has been shown to modify itself constantly as a result of learning. Similar modifications take place after brain damage resulting in recovery of function. People who face movement difficulties with their one arm and hand tend to use the healthy hand during activities. The phenomenon of “learned non-use” is very common in hemiplegia. Constraint-Induced Movement therapy (CIMT/ CIT) or CI therapy is a new therapeutic approach to rehabilitation of hand and arm movement after stroke, cerebral palsy, brachial plexus injury, multiple sclerosis (MS) and traumatic brain injury (TBI). 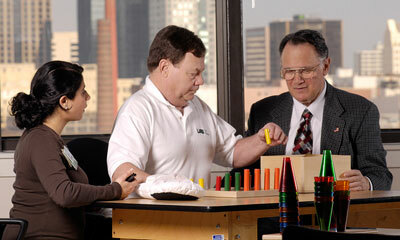 CI therapy consists of a family of treatments that teach the brain to “rewire” itself following a neurological injury. CI therapy is based on research by Prof. Edward Taub and his collaborators at the University of Alabama at Birmingham, USA that showed that patients can learn to improve movement of the weaker part of their bodies. CIMT is a 2-3 week treatment program that includes restraint of the non-affected hand for most of the waking hours and intensive practice of the affected one for specific hours per day. Practice is focused on everyday activities that are important for the patient and takes place in the clinic and at home. The daily home-based program is tailor made to match each person’s abilities and interests. CIMT includes restraint of the non-affected hand and intensive, everyday practice to the affected arm and hand. CIMT’s functional effects have been observed as early as on the 3rd-4th day of the program. Improvements have been recorded to last for years after termination of therapy; the reason for this is that CIMT eventually increases the spontaneous use of the affected hand. That is directly linked to research studies showing that CIMT is the only rehabilitation technique to markedly change the organization of activity in the brain and remodel brain structures. CIMT is the only rehabilitative technique that is evidence based to substantially improve arm and hand movement in both adults and children in a 2-3 week period. A large, supporting body of research studies is available, some of which are large sampled randomized controlled trials. The most important finding from research studies and clinical observations is that improvements last for months or years after termination of the CIMT program. CIMT is suitable for adults and children that face movement difficulties (mostly) with their one arm and hand. This might have been the result of a central or peripheral neurological damage. Although CIMT has been primarily designed for hemiplegia (muscle weakness and movement difficulties of the one side of the body), it can also be effective in quadriplegia when the one side of the body is the one that causes the main dysfunction. In general, CIMT is suitable for any case that non-use of the one arm/ hand affects the person’s independency in everyday activities. To determine whether CIMT might be suitable for you, our therapists will apply a thorough functional evaluation. The assessment, planning and application of CIMT programs is implemented by a team of occupational therapists, specializing in Neurorehabilitation. We have been trained in CIMT and have years of experience in the application of this treatment in various clinical cases. The CIMT team is led by Dr. Pavlina Psychouli, an occupational therapist with years of clinical and research experience on CIMT. She graduated from the School of Occupational Therapy of the Technological Educational Institute of Athens in 2001. Two years later, she was awarded an MSc in Neurological Rehabilitation from Brunel University of London and completed her PhD on “modified CIMT for children with cerebral palsy” at the University of Southampton. Dr. Psychouli has been trained as a Constraint Induced Therapist by Prof E. Taub, the Founder of CIMT and his associates at the University of Alabama at Birmingham, USA. Dr. Pavlina Psychouli has applied CIMT in many different clinical cases, in both adults and children, while the efficacy and improvement of the technique has been her main research interest over the last decade. In her clinical intervention, she has applied and tested a combination of therapeutic techniques as long as they are evidence-based and have proven to affect the way human brain works. She has worked as an Associate Lecturer for the School of Occupational Therapy, at the Technological Educational Institute of Athens in Greece from 2008 to 2015. Since October 2015, she is the Coordinator for the Occupational Therapy Program of the School of Health Sciences at the European University of Cyprus. Our CIMT team has the experience to discuss and evaluate the client’s condition in order to suggest the most appropriate intervention for you. For more information, please contact us.